Are the wheels flying off Trump’s ‘fine-tuned machine’? “A fine-tuned machine” does not experience the kind of malfunctions we are witnessing within Donald J. Trump’s administration. For instance, it doesn’t produce an FBI director asking the Justice Department to dismiss an explosive allegation coming from the president of the United States against his immediate predecessor. 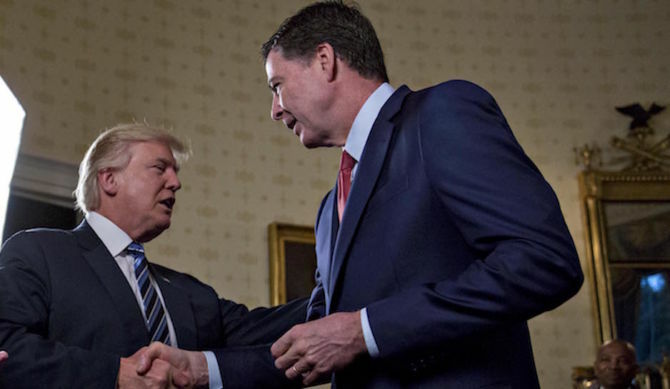 FBI Director James Comey wants the Justice Department to toss out Trump’s allegation — delivered this weekend in a tweet — that Barack Obama ordered spooks to wiretap Trump’s offices in Trump Tower. Why would they do such a thing, which they have denied doing? It would be to look for evidence that Trump’s campaign was colluding with Russian officials to interfere with the U.S. presidential election. Trump calls it a “fact” that such a thing occurred. Comey, in an apparent act of open rebellion against the president, says, um, no it isn’t. It didn’t happen. At this moment, DOJ officials haven’t done as Comey has asked. Ladies and gents, we are witnessing perhaps the first shots of open warfare within the Trump administration. It might be Trump v. Comey in this fight. Former Director of National Intelligence James Clapper said on “Meet the Press” this morning that any such order to wiretap Trump’s office would have had to come from a federal judge, who would have determined probable cause to issue such an order. The DNI, said Clapper, would be made aware of it. Clapper said it never occurred during his time as DNI. Comey has taken up Clapper’s side in this fight. The “fine-tuned machine” — which is how the president described his administration during that infamous press conference a couple of weeks ago — appears set to explode in flames. What happens now? The president might fire Comey. What do you suppose would be the public reaction to such an event? The president, moreover, is reportedly furious at Attorney General Jeff Sessions for recusing himself from an investigation into Russia’s alleged effort to influence the presidential election. Does that sound to you like a “fine-tuned machine” that is humming along on all cylinders? Me neither. Comey’s request of the DOJ to drop this wiretap nonsense is fascinating at another level as well. The FBI director heaved that political grenade into Hillary Clinton’s presidential campaign 11 days before Election Day informing her of a letter he had sent to Congress asking for a re-examination of that e-mail controversy that dogged her all along the way. Clinton blames that letter for stopping her momentum and for giving Trump the ammo he needed to blast her presidential campaign to smithereens. Now he turns on the individual he supposedly helped get elected?